Platoon was made in a time when Charlie Sheen was the normal one and Oliver Stone was considered to be unpredictable. Since then Stone’s film choices have mellowed out, while Charlie Sheen has catapulted himself into infamy. Perhaps this will even help him somehow, though I can’t imagine how. Instead of holding my breath to find out whether he is going to be dead, arrested or catapulted back into stardom, I’ll just watch one of the best films he ever made. Winner of four Academy Awards including Best Picture and Best Director in 1986, Platoon is a brutal depiction of war based on Oliver Stone’s experiences in Vietnam. Charlie Sheen plays Chris Taylor, a man who struggles with a fight between the Viet Cong and his own sanity in the jungle. At the same time his commanding officers, played by Tom Berenger and Willem Dafoe, are fighting their own battles with sanity and each other in the deep jungles of Vietnam. The Blu-ray package also comes with a DVD version of the film, which in itself has a number of special features, including a great commentary track with writer/director Oliver Stone and a documentary with interviews with the cast and Stone. There is also a separate commentary track by military supervisor Dale Dyle and a photo gallery. 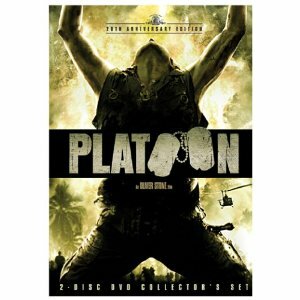 The Blu-ray also includes a featurette “Flashbacks to Platoon,” two documentaries and three vignettes.